Bossed Tapping/Repair Clamps - CASCADE PLC - The new home of Cascade Clamps UK Ltd, Suppliers and Manufacturers of pipe fittings to the water & gas industry. 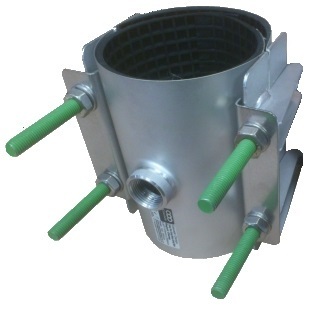 Cascade Bossed Repair Clamps are ideal for creating connections in a water supply network, made from high quality Stainless Steel and fitted with a full matted waffle gasket available in WRAS approved EPDM or NBR for Gas and oils. Available in a wide range of sizes and can be made to specifications, with a choice of outlets from 1/2" to 2" male or female threaded BSP. Please see the downloadable E-Brochure for more information and specifications.